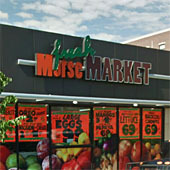 Morse Fresh Market established itself as a forerunner to some newer and larger chain stores by providing reasonably priced organic foods and gluten free products for customers since the store’s opening. Our Hot Food services provide fresh takeouts, made to order, for great tasting sandwiches, soups, or salads. We recommend our in-store made daily guacamole and salsas as a special anytime side dish. Ask our informed staff about special pricing on crate orders of fresh fruits or any other unique requirements you may have; we serve to please your every fresh market need!